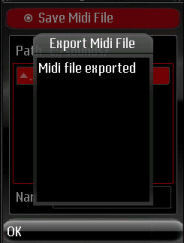 Upon selecting the "Export Midi File" option from the Song Options, a screen is displayed which asks for the format wanted. 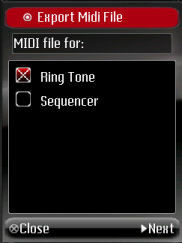 A Ring tone Midi File is very compact. The file is generated as a single track Midi File (Midi File Format 0). 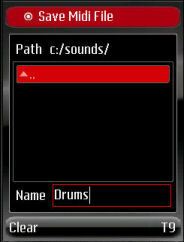 A Sequencer Midi File takes more time to generate and contains one track per instrument used in the song. Each track is named after the instrument. For example, track 1 is named "Acoustic Bass Drum", track 2 is called "Acoustic Snare".... The Midi file format for this type of file is Midi File Format 1. It should only be used when it is intended to use the Midi file in a sequencer capable of importing Standard Midi files. 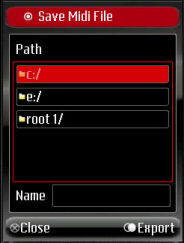 In this example, the default format "Ring Tone" is accepted by selected the "Next" menu option.